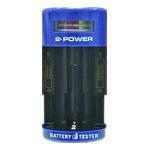 Battery tester for both rechargeable and alkaline batteries. Quickly and easily check the state of your batteries before you discard. The compact size allows you to carry the tester with you on the go in a vehicle glove compartment, camera bag, luggage or backpack. Insert one battery into the tester, ensuring the correct polarity. Press down on the tester to make contact with the battery and check the indicator to determine the battery strength.